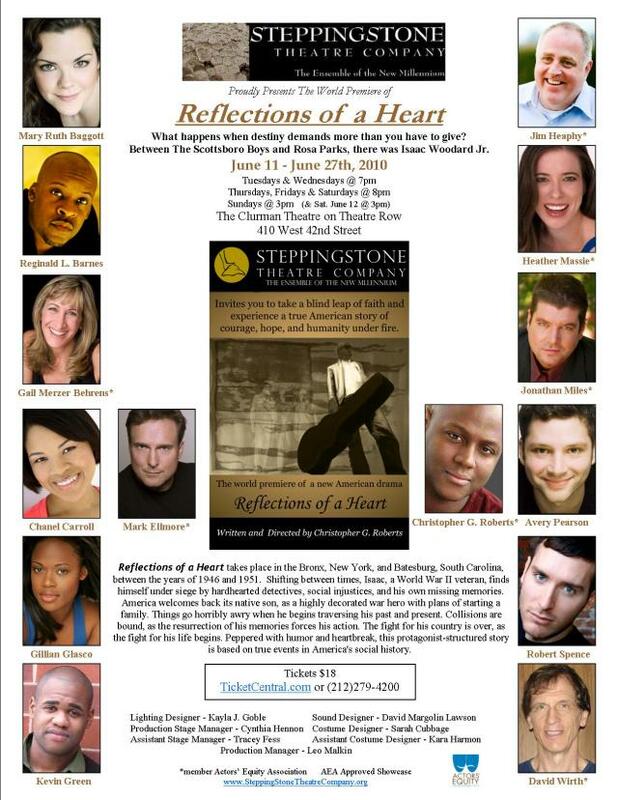 For those of you in NYC who enjoy a good Off-Broadway show, you might want to check out the Stepping Stone Theatre Company‘s presentation of REFLECTIONS OF A HEART. Opening next Friday (June 11th) at 8PM and running through Sunday, June 27th, the show is written and directed by Christopher G. Roberts. The story is based on the life of Isaac Woodard, Jr., who was a highly-decorated WWII veteran, beaten and left blind by the police, just hours after he was discharged from the Army. This will be the world premier of the show. 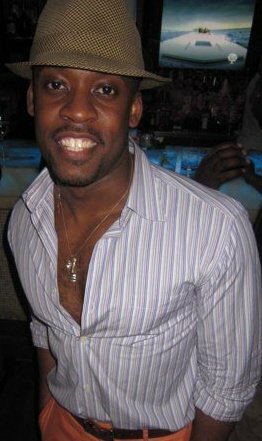 Reginald L. Barnes is cast in the role of Henderson, Woodard’s best friend and the play’s narrator. Typically Barnes plays the role of comic relief, with the exception of the superb job he did as the dramatic lead in the (almost) one-man play Die Laughing a couple of summers ago. With REFLECTIONS OF A HEART, we get more of that drama. The guy has potential; keep an eye on him. Between the Scottsboro Boys and Rosa Parks, there was Isaac Woodard, Jr. Filled with humor and heartbreak, REFLECTIONS OF A HEART is based on true events in America’s history that were almost lost in time. Set between 1946 and 1951, the play takes place in the Bronx and South Carolina. Shifting between times, African-American WWII veteran Isaac Woodard, Jr. finds himself under siege by hard-hearted detectives, social injustices, racial prejudices, and his own missing memories. America welcomes back its native son, as a highly decorated war hero, with plans of starting a family. Things go horribly awry when he begins traversing his past and present. The fight for his country is over, as the fight for his life begins. In February 1946, Sergeant Isaac Woodard, Jr. (1919-1992) was beaten by police in Batesburg, South Carolina, following an innocuous incident on a Greyhound bus. Blinded during the assault, Woodard became the first national symbol in the fight against racial injustice, and garnered support from the likes of President Harry S. Truman, Lena Horne, Harry Belafonte, Orson Welles and the NAACP. Although Woodard’s story is nearly forgotten today, he inspired folk singer/songwriter Woodie Guthrie to write the deeply moving ballad “The Blinding of Isaac Woodard,” using some of Mr. Woodard’s own words: ” It’s now you’ve heard my story, there’s one thing I can’t see. How you could treat a human like they have treated me?” This thrilling American story might have been lost, had it not been for a chance meeting between Roberts and the son of Isaac Woodard Jr. The ensemble cast of REFLECTIONS OF A HEART includes Mary Ruth Baggot, Reginald L. Barnes, Gail Merzer Behrens, Chanel Carroll, Mark Ellmore, Kevin Green, Gillian Glasco, Jim Heaphy, Heather Massie, Jonathan Miles, Robert Spence, Michael Vincent, and David Wirth. REFLECTIONS OF A HEART features set design by Jito Lee; costume design by Sarah Cubbage; lighting design by Kayla Globe; and sound design by David Lawson. The play runs at Theater Row’s Clurman Theatre, 410 West 42nd Street between 9th and 10th Avenues. Tickets are $18 and can be purchased online at http://www.ticketcentral.com or by calling 212-279-4200.